If creating a mind-blowing website for your business is on your mind, then you might be wondering as to which CMS(Content Management System) would turn to be your best choice. Well, with the availability of numerous CMSs in the web market, it is obvious to get confused about the best one. The reality is that there's no one-size-fits-all solution for choosing the Content Management System(CMS) for your website. It all depends on your business goals, budget, technical expertise and the exactly what you want your site to do. If you're looking for building a simple blog or a brochure website then WordPress could be the best bet. Likewise, for the more complex website, choosing Drupal would turn to be the right decision. Finally, if you're looking for something between simple and complex, then Joomla is your best fit. So, combating all your confusions, I'm writing this post which will enable you to make the right choice between Joomla and WordPress CMSs. 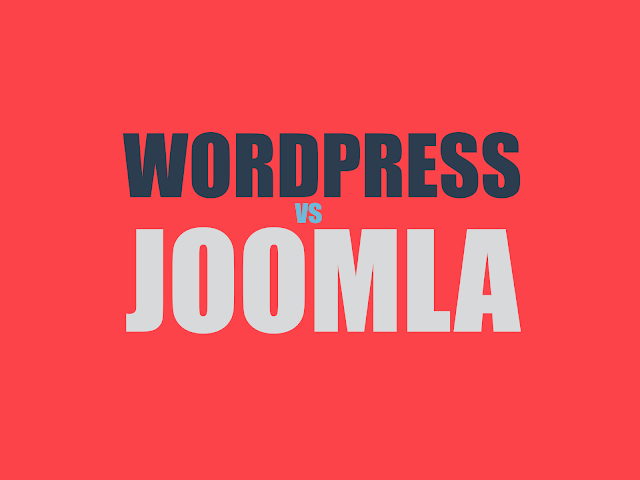 I recommend you to also checkout Wordpress vs Drupal and Joomla vs Drupal. 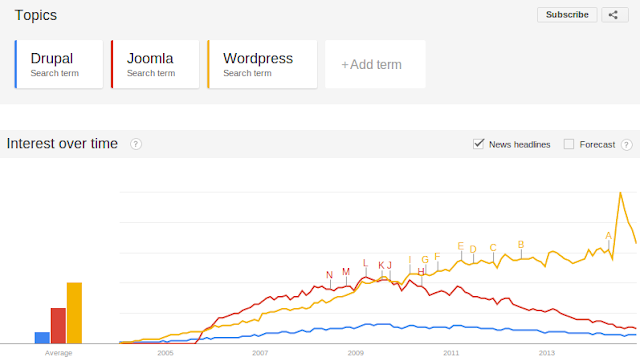 As you may see from Google trend snapshot above, Wordpress is most popular of all CMS. Specially for beginners, it leads due to ease of use and simple learning curve. If you are a beginner at web technology and still learning. The best CMS for you will be a hosted Wordpress solution to get started. It does not require a lot of skill to start a wordpress blog or a website and there is plenty of help available on web and Google. However, in long run as well as for people with little more skill Joomla may prove a good option for variety of reasons. Released in the year 2005, Joomla offers a middle-ground between developer-oriented capabilities of Drupal and the complex website development options available in WordPress. Having witnessed more than 30 million downloads till date, Joomla has emerged as a fabulous open source content management system that's being used by web developers all over the world. Specially designed to perform as a community platform, Joomla CMS has worked as a brilliant option for people who're looking forward to build social networking websites, online forums etc. Joomla CMS is loaded with absolutely amazing SEO-friendly features that make way for creation of websites that have the potential of ranking high on all major search engine results pages. These SEO-friendly features also render a perfect look to your website. Joomla CMS is packed with multiple extensions such as templates, languages, components, plug-ins and modules. This makes it convenient for the web developers to work on varied web development projects. With Joomla CMS, web developers find it tedious to add customization into their projects. Also, the big learning curve makes the entire process even more daunting. Since Joomla CMS can't be handled by simple or small websites, it definitely isn't the best option for people who're looking forward to build less complex web portals. Released in the year 2003, WordPress is an outstanding CMS that has witnessed more than 140 million downloads till date. As one of the finest open source content management systems, WordPress has been chosen by some of the industry biggies including Forbes, CNN, Sony and many more. One of the greatest advantages of WordPress CMS is that it is rich in plugins and themes. With over 2000 free themes and 27,000+ free plugins, WordPress offers extensive flexibility to web developers with varying levels of expertise. Yet another asset of WordPress that makes it popular among the variety of Content Management Systems is the easy and quick setup. Backed by a user-friendly interface, WordPress enables you to get started with blogging rightaway. WordPress comes with strong support for your site's search engine optimization. There are seo-friendly plugins and modules that play a vital role in enhancing your site's search engine ranking by huge bounds and leaps. If you're thinking about building a complex e-store then WordPress CMS is what would turn to be a bad option. Unlike the very popular Drupal CMS, WordPress CMS lacks the fine-quality security features that can ascertain the hacker-free status of your website. With all the three very popular content management systems(CMSs) having their own set of advantages and disadvantages, it is up to to analyze your requirements before settling down for one. Edward Jones is a web developer who has an inclination towards blogging. As a professional working for OSSMedia Ltd., a Custom Wordpress development Services, Edward's area of expertise is quite vast and covers major CMS platforms like Drupal, Wordpress, Joomla and Magento.